Peter Goodwin: England have completely broken the West Indies. I haven’t seen a team this dominant bowling wise over two games. Jov: Looks like it’s going to be another early night. Jason Holder plays a textbook forward defensive to the final ball of the over. Incidentally, no English bowler has taken a five-for in T20I cricket before. Nicholas Pooran is the latest batsman to attempt to stop the rot. David Willey has his best T20 figures – after just 27 balls! A push forward from Darren Bravo and the ball takes the outside edge and ends up nestled in Jonny Bairstow’s gloves as he dives behind the stumps. West Indies are in absolute disarray and Willey has figures of 4-6 from 2.3 overs. Jason Holder is in at five. It’s another big shot gone awry for West Indies. This time it’s John Campbell who is culpable. He tries to smack Willey over long-on and ends up spooning the ball high into the air. Joe Denly jogs around and steadies himself for a good catch in the covers. John Campbell advances and blasts a thunderous straight drive through his batting partner’s legs, but David Willey cuts it short at mid-off. Darren Bravo ends the over with a tentative prod at a Jordan slower ball. Short from Chris Jordan, and John Campbell rolls his wrists to pull a lovely four through backward square. Oh, and again! Just a bit too straight from Jordan, and Campbell swings another boundary away. Chris Jordan is going to replace Tom Curran. Up and over – but Darren Bravo manages to push the ball over the head of the fielders! It’s short from David Willey and Bravo swings hard at it, but again, the ball holds up in the surface. There’s enough oomph on the ball to beat the man at extra cover and roll into the boundary rope for four. David Willey has figures of 2-2 at the minute. Shimron Hetmyer tries to go big but it’s a clever slower ball from David Willey, and the batsman doesn’t time his drive properly. And of all the fielders to hit a ball to, Chris Jordan is the least likely to drop it. He takes a comfortable catch jogging backwards at mid-off, and once again, West Indies are two down for not a lot. Rich Taylor: No matter what, David Willey has to be in the World Cup squad. Left-arm magician for me. Eoin Morgan goes leaping through the air at cover to stop Shimron Hetmyer thundering a full toss for four. This is a little leg-side from Tom Curran, and Hetmyer is super quick between the wickets, snaffling a few extra runs here and there. Stoney: The Windies might struggle to surpass 45 if they carry on like that. 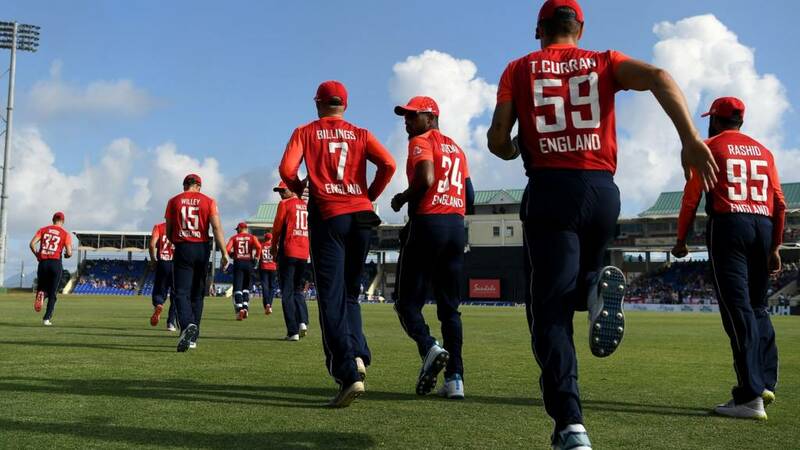 It’s not entirely safe from Shimron Hetmyer, going with hard hands at Tom Curran’s first ball and working it uppishly through cover, but there’s enough bat on ball to run to the boundary. And to share the opening honours, it will be Tom Curran. John Campbell dabs away the final few balls of the over. Well, a run, to be precise, as Hetmyer guides the ball through backward point to get off the mark. Previous articleIs Putin building his own version of China’s Great Firewall?